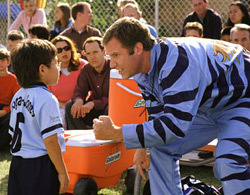 First, take every underdog-sports-movie cliché you can think of and liberally apply them to a little league soccer team. Next, virtually ignore the team members as characters, except to sprinkle the soundtrack with ethnic music every time an Asian or Italian kid is on the screen. Then focus all your energy on their whiney, klutzy, insecure, dumb-as-a-post sitcom-dad coach, and be sure to cast a shameless ham to play him -- like, say, Will Ferrell. And just for good measure, hire a famous tough-guy coach from an entirely different sport in a major supporting role, but first make sure he's an embarrassingly bad actor -- former Chicago Bears honcho Mike Ditka will do nicely. Fold these ingredients into a script driven by gimmicks (when Wimpy Dad drinks too much coffee, he turns into a raging jerk -- ahh, ha, ha, ha, ha!) and bake for 87 minutes which feel more like two-and-a-half hours. Serve with stale popcorn. Cooked up by the writers of "Space Jam" and lackadaisically directed by Jesse Dylan ("American Wedding"), this supposed kids' movie isn't about the kids at all. Even the 11-year-old son, whose team of misfits Ferrell decides to coach, has only four or five lines of dialogue. The plot is driven instead by the childish rivalry between sissy Ferrell and his aging super-jock dad (Robert Duvall, slumming for an easy paycheck) who is the taunting, win-at-all-costs coach for another team in the league. Ditka plays Duvall's next door neighbor who becomes Ferrell's assistant coach out of spite, stemming from a dispute over the disposal of yard waste, and despite his cue-card performance, he has more dialogue than all the soccer-playing kids combined. An incompetent coach to begin with, Ferrell gets all wrapped up in beating his dad at the expense of having fun, but inevitably comes to learn the trite lesson that Winning Isn't Everything. Of course, this hypocritically leads to the same Big Game finale as every other hackneyed underdog-sports movie in the history of cinema, in which the hapless team is suddenly blessed with unexplained skills -- skills portrayed so unconvincingly it's downright painful to watch. But the most agonizing ingredient in "Kicking and Screaming" is the sting of watching Will Ferrell, after two surprisingly witty performances in "Elf" and "Melinda & Melinda," revert to the same old one-note, dim-bulb clowning that aggressively stupid plots seem to bring out in him. Can't somebody get this man a gourmet script and keep him away from such cinematic junk food?